Strangers until just a few minutes earlier, the students from Cuba and the United States sat on the balcony of a home in northwest Havana, making awkward conversation. Then the music started. And just like that, barriers of language, culture and politics fell away. 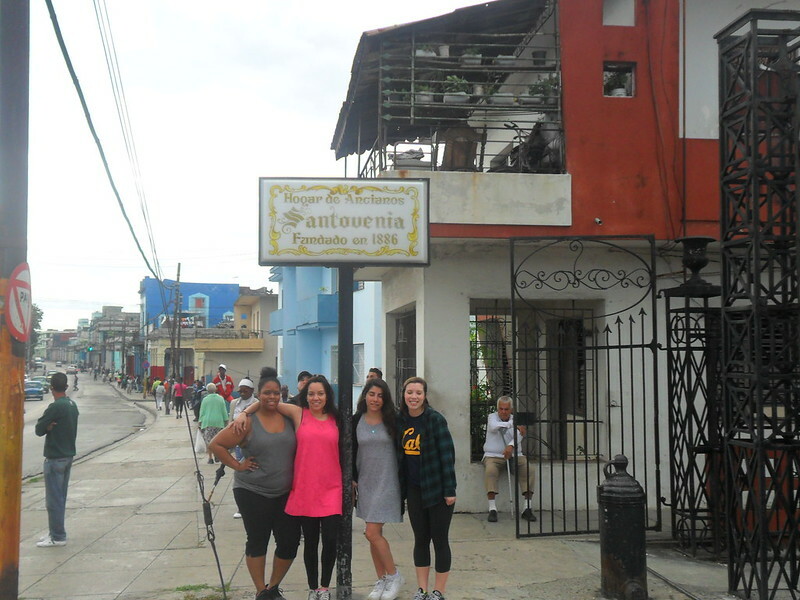 “As soon as they played the music, they got up and tried dancing with us and teaching us all how to salsa, how to bachada,” said Lola Solis ’19, a triple major in history, political science and women’s studies, recalling that evening during the second week of Hofstra’s annual study abroad program in Cuba. “It’s nothing like I expected it would be,” she said. “It’s definitely been life-transforming. For the nine students who made the 21-day trip in January 2017, the scarcity and simplicity of life in Cuba – from the 1950s cars to the empty supermarket shelves to the limited Internet service - challenged every convention of their lives back home. The study abroad trip combined two classes: Journeys through Latin America: Contemporary Cuba, taught by Murillo, and Health, Culture and Elder Care in Cuba, taught by Kirby Veevers, an adjunct professor of Health Professions who specializes in palliative care, aging and long-term care. “Every time the students step out into the street it’s a learning moment for them. 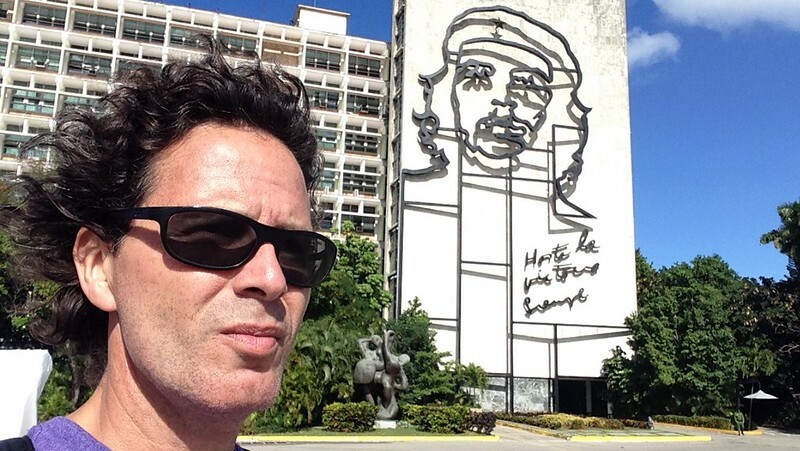 From the crumbling buildings to the old cars driving by to the markets that they pass by, they are embracing and engaging with the situation in Cuba as it is today.” -- Mario Murillo, professor of Radio, Television and Film. The two classes spent their mornings together, learning about various aspects of Cuban life and history, including its history and the communist revolution, the role of media, and its political relationships with the rest of the world, particularly with the United States, which restored diplomatic relations with Cuba in 2015 and relaxed some travel restrictions but maintains an economic embargo of the island nation. In the afternoons, the classes separated. 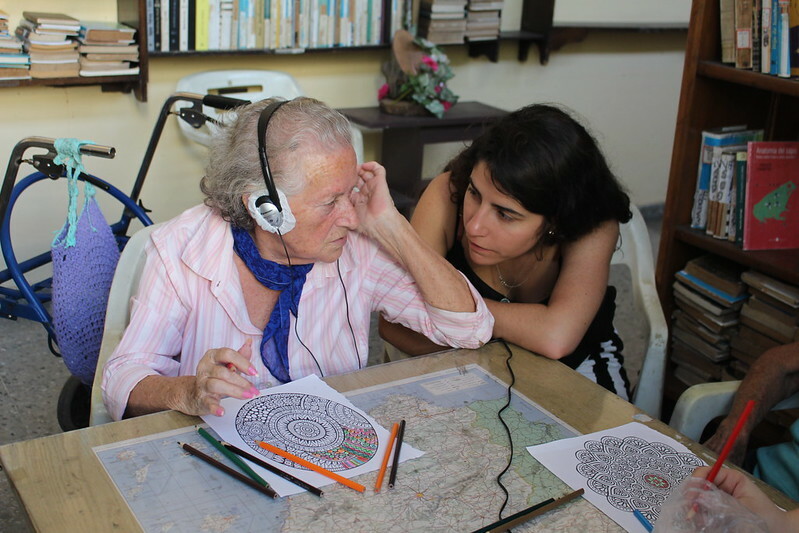 Students in the contemporary Cuba group visited places such as Radio Havana, Jose Marti International Institute of Journalism and the Cuban International School of Cinema, talking to journalists and filmmakers about their work, while those in the health professions class volunteered at various elder care facilities throughout Havana and were exposed to socialized medicine in practice. For the health students, Cuba offers a chance to interact with patients in ways that are not always possible in the United States, particularly for undergraduates, Veevers said. “They just rolled up their sleeves and dived into it, and the reactions from the residents and the patients has been so rewarding for the students that they’ve gone above and beyond,” Veevers said. “The work is hard – working in these facilities, engaging with older adults can be draining. When we were leaving a facility and they’re throwing their arms around these elders and the elders are hugging my students – I didn’t expect the level of connection would be that deep or that powerful,” Veevers said. In Cerro, one of Havana’s poorest boroughs, the converted convent that is now home to the elder care facility called Santovenia sits at the end of a long driveway, a grand, beaux arts-style building with airy, sprawling, tiled interior courtyards. Of all the places Veevers’ students visit, it is at Santovenia that they forge the most profound bonds. 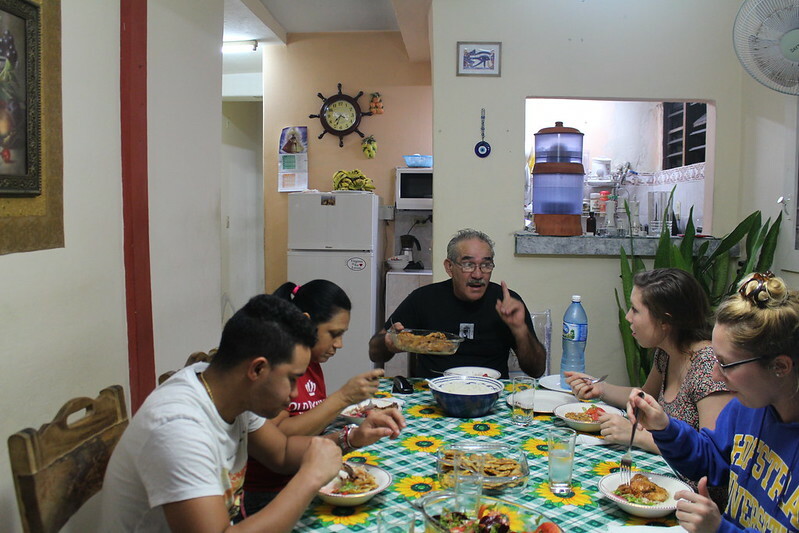 While they worked at facilities throughout Havana, they insisted on returning during their free time to Santovenia, a facility run by nuns who care for 140 day residents and 380 full-time residents. 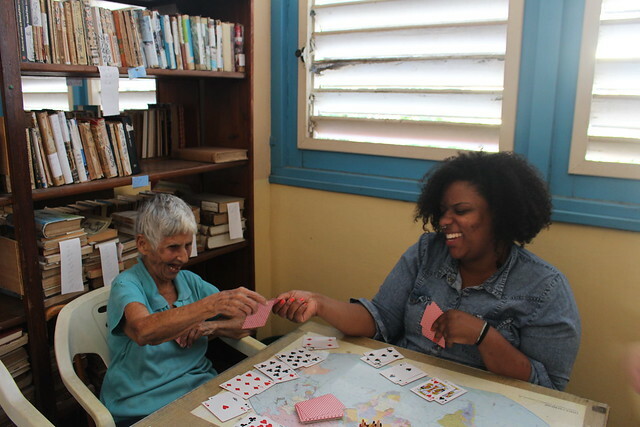 The activities the students led were simple – card and board games, drawing or using IPods filled with Cuban music to spark conversation and dancing. Some of the students spoke Spanish, but most could not. “Considering I don’t speak a word in Spanish, I was scared at first, but when we went to the facilities, you can just show them that you want to be with them,” said Jenny Segal ’18, a health sciences major/forensic science minor. In fact, Segal, who aspires to a career working with autistic children, thinks navigating language barriers can be critical preparation for a career in health care. The first thing health sciences major Pamela Roscoe ’20 noticed was the buildings. 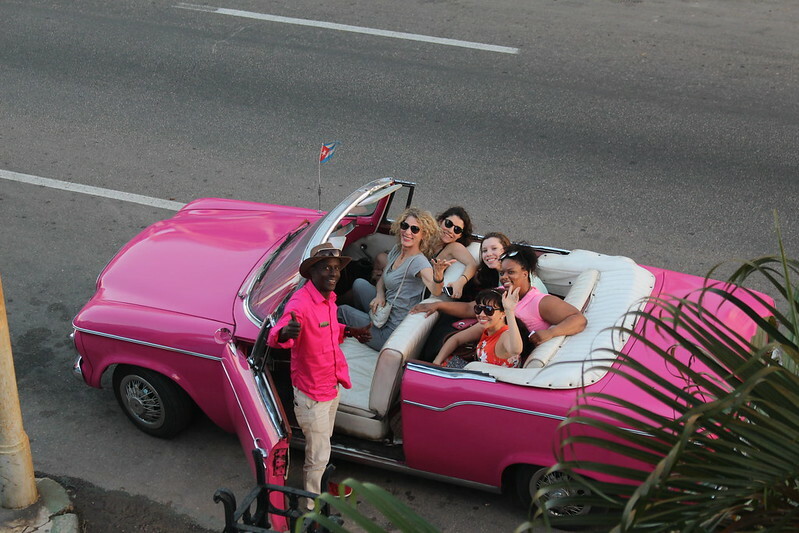 The students stayed in the Vedado neighborhood – a grid of colorful buildings in a mix of styles - Art Deco, Spanish neo-colonial and Beaux Arts – bisected by cobblestone side streets and broad, landscaped avenues that lead to the Malecon, Havana’s legendary waterfront esplanade and seawall. The group had just landed in Havana when radio production major Ben Abrams ‘ 19, spotted a billboard featuring a noose around a map of the island that read: “BLOQUE” – blockade in Spanish, a reference to the U.S. embargo. 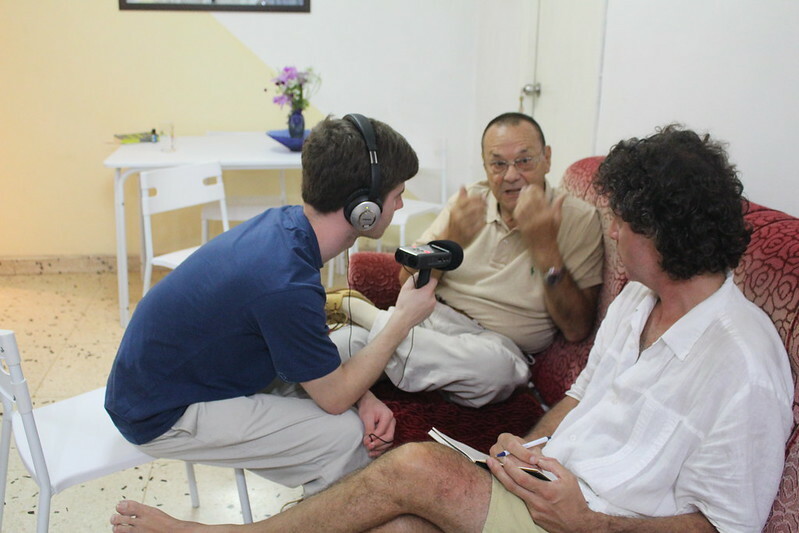 In their visit to Radio Havana, the students met with reporters, producers and researchers who described the day-to-day work of covering Cuba for a local and international audience. The official government-run radio broadcasting station, Radio Havana broadcasts in nine languages, including English. The Radio Havana staff described covering perhaps the biggest story of their careers – death of Fidel Castro in November 2016, as well as addressing questions about whether or how much editorial control the Cuban government and the Communist Party of Cuba, exercises over news coverage. But like the BLOQUE billboards all over Havana, the specter of the embargo and the political conflict with the United States looms large, the news director said. “It’s history and I want to be here while history is happening, to be able to see it first-hand instead of seeing it on the news, to be able to talk to the people and see their point of view on the world,” – business major Jack Sasson ’19. 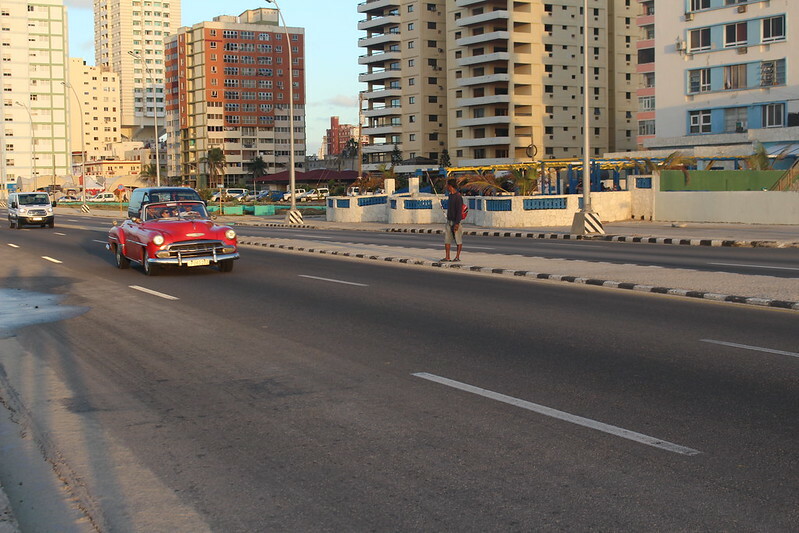 The study abroad trip to Havana was Murillo’s first to Cuba in more than 20 years. When he visited in 1993, the island was in the throes of the ‘special period’ – a severe, extended economic crisis ushered in by the break-up of the Soviet Union, which was Cuba’s largest trade partner. Since 2011, the Cuban government has taken small steps towards economic reforms, easing restrictions on private sector businesses, which has spawned a fledgling Cuban entrepreneurship movement. 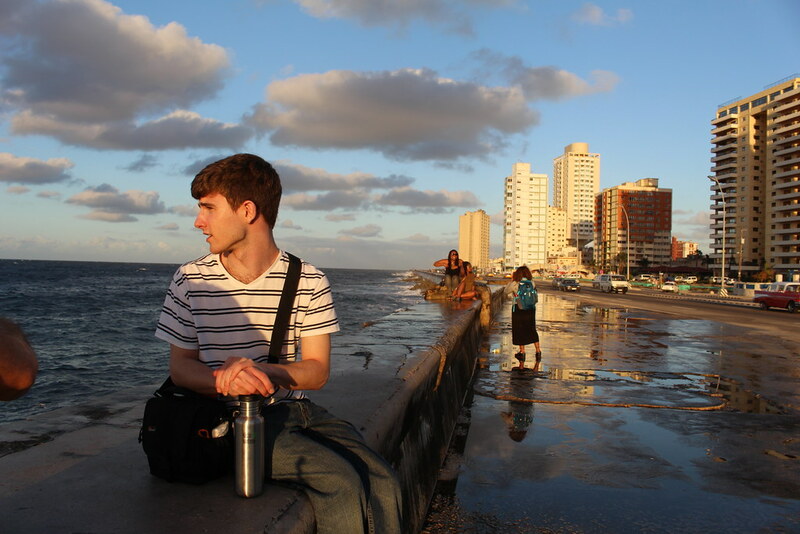 Every morning before class, business major Jack Sasson ’19 wandered through the neighborhoods of Havana with no particular destination in mind. He walked through open-air markets selling everything from produce and eggs to flowers and meats. He stopped in front of a nearby hotel with a strong wi-fi signal where crowds gather at all hours to check email or FaceTime with faraway family and friends.